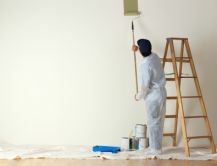 Interior painting is one of the least expensive ways to upgrade your home. You can transform a room from ordinary to sublime. All you have to do is pick the right color scheme, hire us and your in business. Our job is to make your home improvement experience as painless as possible so we will also provide you with information to help you choose the perfect color(s) for the room(s). What Type Of Paint Should You Choose? First you should choose a good quality paint like Benjamin Moore then you have to decide whether you want to use oil (alkyd) or latex paint. Oil paint is very durable but it's hard to clean up and it normally has a strong odor. We recommend using oil paint for interior of commercial buildings and home exteriors. Besides moving the furniture choosing the right color is the biggest challenge for you. Of course white is a safe choice but why not be daring and spice up you rooms with some color. Many people find this to be a daunting task but we assist by recommending some colors based on what the room is being used for and your personality. You can do this yourself by getting a color wheel and choosing a color that you think will be suitable. If you pick the right color scheme you abode can look fabulous without breaking the bank. To Sheen Or Not To Sheen That Is The Question? After choosing the color you will have to determine what type of sheen (luster) you want the paint to have. In general, flat paint hides imperfections but is harder to keep clean since this finish does wipe well (there is washable flat paint but it is expensive). Flat is good for walls and ceiling. The more glossier the paint the easier it is to clean but beware if you have bad walls all the marks will show. You can use this finish on trim, in kitchen or any areas where spills may occur.